Benjamin J. Mooreside was arrested after allegedly traveling more than 70 mph on Western Avenue, then eluding police after crashing his vehicle and escaping on foot. 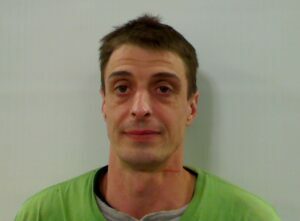 AUGUSTA — A 37-year-old Eddington man led police on a high-speed chase and eluded them on foot before being arrested Tuesday, police said. Benjamin J. Mooreside is charged with eluding a police officer, leaving the scene of an accident and reckless conduct with a dangerous weapon. He also was arrested on an outstanding warrant and for habitual operation of a vehicle after his license was revoked. Mooreside was driving a vehicle about 2:30 p.m. Tuesday on Western Avenue when Augusta police Officer Jesse Brann observed him smoking what appeared to be marijuana, according to Augusta police. According to an arrest affidavit, Augusta police Officer Christopher Hutchings pursued the vehicle, a tan Subaru. Mooreside used his right blinker as if he were planning to turn right at the Armory Street intersection, but sped west on Western Avenue instead, eventually reaching speeds in excess of 70 mph. Mooreside allegedly turned south onto Edison Drive, again exceeding 70 mph, and into the parking lot of Central Maine Power at the end of the road. Hutchings lost sight of the vehicle in the CMP parking lot, but soon found it near the parking lot, crashed into a tree. Mooreside was not inside. Five hours later, police found Mooreside at the Ground Round in Hallowell, where he was arrested, the affidavit stated. At least 12 officers participated in the pursuit of Mooreside. Prosecuting attorney Tyler LeClair said the speed zones of Western Avenue and Edison Drive are 25 mph and 35 mph zones. Eluding a police officer and reckless conduct with a dangerous weapon are class C felonies, punishable by up to five years in prison. Mooreside had his initial appearance Wednesday in Kennebec County District Court, represented by attorney William Baghdoyan, where Judge Deborah Cashman set his bail at $3,000 cash or $500 with a Maine Pretrial Services Contract. Conditions of release include that he may not use drugs or drive a motor vehicle, and he would be subject to random searches and testing. His next court appearance is scheduled for 2 p.m. June 4.